Today’s post is two-for-one: two recipes that I had been wanting to make for a long time, and I made them both the same day! I needed to bring something to work, and have some kind of affliction where I cannot bring just one thing. What if that one thing is something that someone doesn’t like? Better to have some variety, I say. I made both of these a day in advance and chilled them overnight to make cutting into pieces (my least-favorite task) easier. Chocolate is popular with most people, so I decided to make David Lebovitz’s Dulce de Leche Brownies. I first saw the recipe in The Sweet Life, but he also has it here on his blog. I am quite smitten with Mr. Lebovitz as of late. Not only because his recipes are delicious, but because he provides measurements in grams. Grams! It’s so much easier to weigh than to measure, and I feel extra-precise when I set the scale to grams. Use good chocolate in these. They’re dense and fudgy, with pockets of soft dulce de leche throughout. I used Jacques Torres 60% chocolate. I was going to make my own dulce de leche, but the grocery store had cans of it for the same price as sweetened condensed milk, so I bought that instead. The store-bought was really thick and difficult to swirl into the batter. Next time, I’d warm it just a tiny bit so it’s softer and easier to swirl. These are sticky, but in a good way! I should have served them in muffin cups to make them easier to pick up. Next up are the Barefoot Contessa’s Peanut Butter and Jelly Bars. I saw her make these on her show ages ago and never forgot about them. Now that I’ve eaten them, I’m definitely never going to forget about them! These are oh-so-tender and they melt in your mouth; better than the standard cookie bar or peanut butter blondie-type thing that I was expecting. Don’t skip the chopped peanuts on top. If I’ve learned anything from Top Chef Just Desserts, it’s that you better have textural contrast to impress the judges. These are soft and tender, and the peanuts on top add a nice crunch and little kick of salt. I don’t have a cross-section photo, but people thought it was neat that the bars look like a sandwich, with a layer of jelly in the middle. Someone said “I’d eat this instead of a peanut butter sandwich.” That would be pretty decadent, but tasty. You can get the recipe here on the Food Network site. I used seedless raspberry jam. As with the brownies, I should have served them in muffin cups for easier, neater serving. This makes a big pan of bars; perfect for a crowd. What a great combination of treats! It’s so hard to decide what to bake and I feel like there should always be a chocolate option, so I can relate to your affliction. 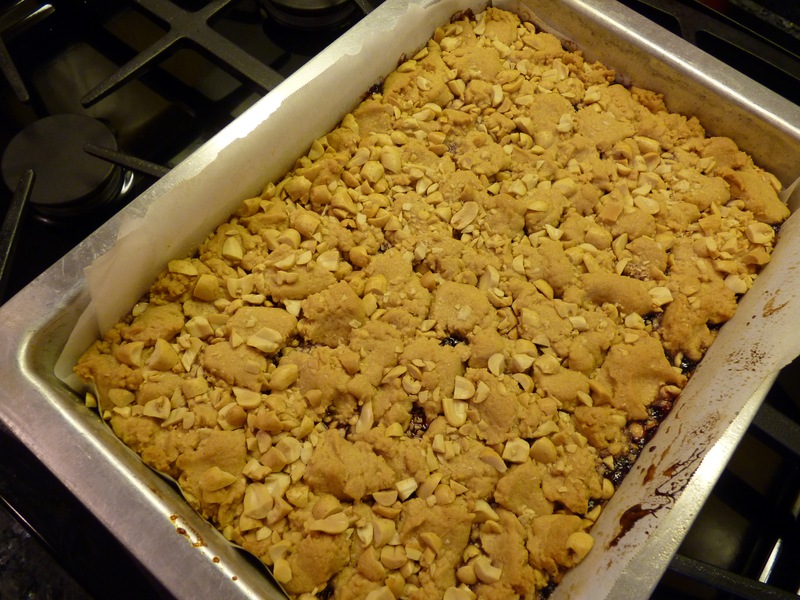 I have made those PB&J bars and they are amazing. Jill, I usually read your posts in Google Reader, but I’m glad I stopped by in person today and saw your new title and header. I like them! Did you take the photo of the blueberries. Textural contrast: what a good way to sum up a useful tip. Those PB&J bars sounds very interesting! Thanks Sarah! I did take the photo of the blueberries – I had a 10 lb box of them! Both bars look amazing but I’m loving the P and J bars best. Anything with peanut butter and raspberry jam is yummy. I’m the same way in that I get paranoid that someone won’t be able to eat something I make. I’m always thinking of peanut allergies or vegans or people who don’t eat chocolate, so it takes me ages to decide what to make and then I like to have options and make a variety. These both look fabulous. And it doesn’t get much better than dulce de leche and chocolate!!!!! Yummo! I would happily chow down on either of these – can I come to your work? I’ve made (and love) both of these recipes! The peanut butter and jelly squares were a huge hit at my house. You should change the name to fork n knife Brownies! I am SO with you on the grams thing, makes life a ton easier! I need to make some dulce de leche so I can give those brownies a try, they sound completely irresistible. 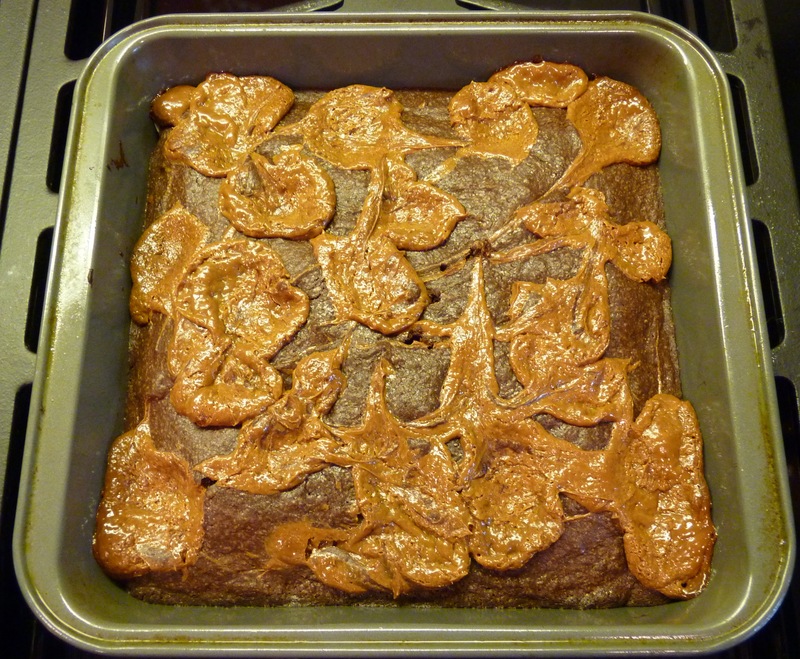 I made those DDL Brownies a few months ago–they were de-lish! I’ve seen those PB&J bars lots and they always sound really good.